Gipsy Kings in Montreal or Quebec City? Inform me about the next events for Gipsy Kings. Enroll yourself to our priority waiting list for Gipsy Kings to be alerted when new tickets are available. Filling this form doesn't engage you to any purchase. The Gipsy Kings are coming back to Montreal on July 1st, 2017, for a concert at Théâtre Maisonneuve of La Place des Arts. This is part of the Montreal International Jazz Festival. The last time we saw the Gipsy Kings in Montreal was in 2013, at the St-Denis Theatre. 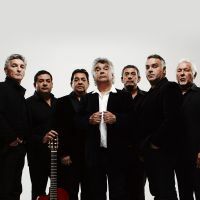 The Gipsy Kings gained some major popularity in the late 1980's with their "rumba flamenca" sound and their hits "Bamboléo" and "Djobi Djoba".